Straight and simple, this is a fun film. I actually wasn’t really interested in what it was about, once it really got going (basically when John Travolta showed up) it was mostly one fun ride. Not usually like me to not care about the actual story, but a film like this that isn’t the appeal. So what was it actually about anyway? Well … James Reece (Jonathan Rhys Meyers) appears to be doing some work with the CIA whilst also working for the US Embassy in Paris. 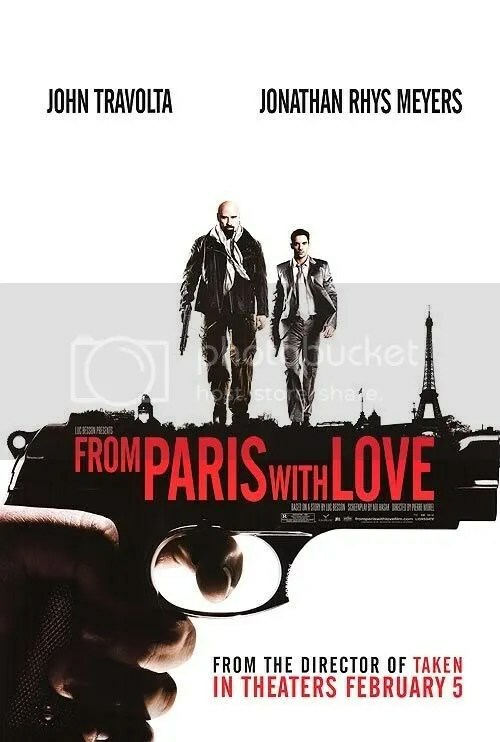 The night he decides to propose to his girlfriend Caroline (Kasia Smutniak), he gets a call to partner up with a man called Charlie Wax (John Travolta). Basically a wild ride ensures, with a few twists and turns along the way. It isn’t all that clear what is actually going on, you need to try and work it out yourself. But once Charlie Wax is in the picture, for me anyway I just threw that all out of the window! John Travolta was on fire here, he was fantastic and he looked like he was having an awesome time with the character. He got to be outrageous and funny, and it all really worked. Jonathan Rhys Meyers worked so well as the more straight laced guy, and these two had such amazing chemistry together. That definitely made this all work, they were the right kind of opposite. Supporting players were all good as well, Kasia Smutniak was not only beautiful but credible as the girlfriend. Action wise is really where this film is at, for the most part it is done quite well. Some sequences are over the top, but they seemed to work all the same. Director Pierre Morel (Taken) clearly knows his stuff, and he did a pretty decent job. Mostly this film suffers from a some what confusing and at times silly storyline, and the pacing at times is a little bit off. But this is certainly an above average action film, made all the more enjoyable by our two leads. I didn’t read too much into it, I just say back and had fun. Easily recommend this film, to those who want to sit back and enjoy Travolta in a really good role.